Donald A. “Chip” Pugh may be a wanted fugitive, but he likes to look good in photos, just like the rest of us. 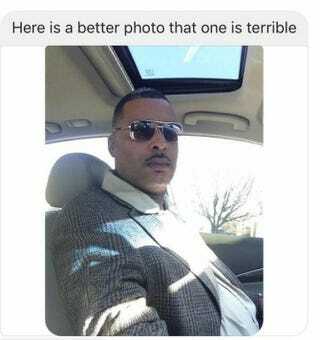 Pugh, 45, gained online attention this week when the Lima Police Department in Ohio put out a booking photo of him indicating that he was wanted after skipping a court appearance, Lima News reports. In the post, cops used a smiling booking photo and said that Pugh was a person of interest in several other cases, including arson and vandalism, the news site reports. Pugh, however, apparently was not impressed with the choice of photo. According to the Lima News, Pugh has had his run-ins with authority on a variety of charges in the past, including domestic violence, breaking and entering, and disorderly conduct. In his radio interview, Pugh acknowledged that he was a bit carefree in the booking photo because he knew he wouldn’t be held on what was a charge of drinking and driving. So, once he was released, he said he decided that he wasn’t going to show up for his court appearance. Pugh then continued to taunt police, joking that he was in Town Square holding a sign reading, “Not guilty.” He then said he was at a McDonald’s and then in a chicken coop, while making rooster noises. Apparently, the crowd ate it up. “At the end of the day, everyone is cheering for Chip,” Staley said on the radio. According to the Lima News, shortly after, a “Free Chip Hugh” Facebook page (now unavailable) was created and reportedly gained some 161 followers this past weekend. Read more at Lima News.